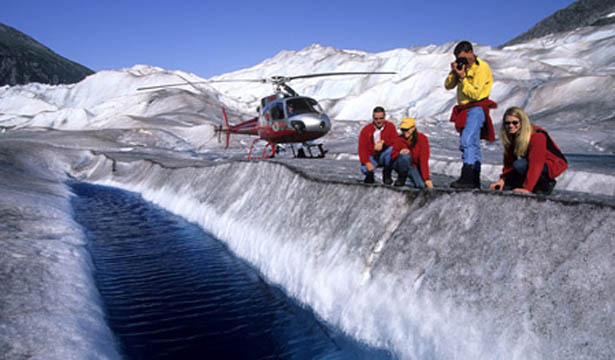 Stand on a living glacier, and enjoy a helicopter tour featuring dozens more. This Skagway Tour includes a 40 minute helicopter tour where you will get up close and personal with ancient glaciers, towering waterfalls, and the bottomless depths of the deepest fjord in the world. You will spend another 40 minutes touring a living glacier on foot with an experienced guide who will show you features such as crevasses, moulins, and crystal-blue glaical pools. Before your flight, you will be equipped with glaicer boots and a safety vest, and then shown a short video desinged to familiarize you with all necessary safety precautions. This tour is recommended for all ages. Persons over 250 pounds will be charged an additional $100 (+tax). Infants up to 23 months are free. Sunglasses, camera, and jacket recommended.